THESE EVENTS ARE SOLD OUT. DUE TO OVERWHELMING POPULARITY, WE WILL LOOK TO REPEAT THE RETREATS IN WINTER 2019. IF YOU’D LIKE TO BE CONTACTED WHEN THE NEW DATES ARE ANNOUNCED, PLEASE EMAIL US AT kiri@toracoastalwalk.nz . 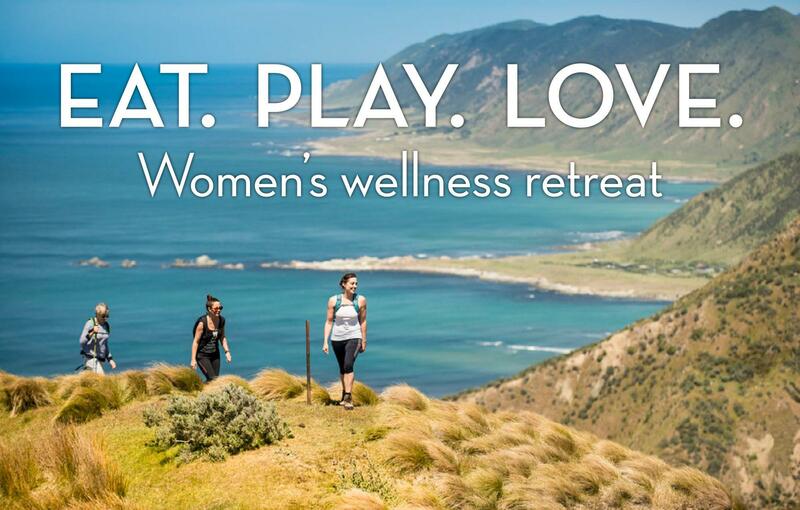 We’re really excited to announce our first ever women’s wellness retreat! “Eat. Play. Love.” is a weekend escape that celebrates you, with delicious food and wine, in the heart of the rugged Tora Coast. It’s the ultimate food for the soul. Soak up the stunning and rugged scenery on a guided 3-hour morning walk over hilltop ridges, native bush and expansive farmland, enjoy an informative session on women’s gut health with dietician Sarah Percy, and find your inner zen with expert yoga instructor Kate McLeay. Top it off with fresh local produce prepared by your hosts Kiri and Jenny, and you’re in for a delicious women’s retreat. Includes all food, a wine-matched dinner at Stony Bay Lodge on Saturday night, two night’s accommodation, a masterclass on fermented foods for gut health, a yoga session with the ocean as your backdrop, and time out to relax. Grab your girlfriends and be part of this special coastal experience. There are two weekends to choose from: Friday 10 – Sunday 12 August, and Friday 17 – Sunday 19 August 2018. Arrival is on the Friday evening, and departure is late Sunday morning. The cost is $399 per person, and spaces are extremely limited. To receive a detailed information pack, including details on your hosts and a programme outline, or to secure your spot, contact Kiri at kiri@toracoastalwalk.nz. Please indicate which weekend you would like to book for, and how many people are in your group, so we can take this into account when allocating sleeping arrangements. Thank you.